Rabbinical seminary at Berlin; founded in 1870 and opened in 1872 as the "Hochschule für die Wissenschaft des Judenthums," which name, upon the order of the government, was changed in 1883 to the one it now bears. A movement for the establishment in Germany of a seminary for Jewish science was begun as early as 1835 by Abraham Geiger, who never ceased advocating the plan until the establishment of the "Hochschule." Geiger found a supporter in Ludwig Philippson, who sought to give the thought currency among the people. Chiefly owing to Geiger's influence, the theological seminary at Breslau was established in 1854; but its conservative theological policy was not approved by Geiger. The "Hochschule" was established upon the principle that the question of religion should not be decisive in the choice of teachers or in the admission of students. It was to be devoted purely to scientific work. Nominally, it has never been a solely theological school; as a matter of fact, however, the training of theologians has been its chief task. For the first twenty-five years the sums received (excluding stipendiary contributions) totaled 348,843.24 marks; the expenses (stipends excluded) totaled 341,750.89 marks. The "Lehranstalt" is supported by annual contributions from the members of a society established for that purpose and by general donations. Contributors and donors elect the "curatorium," which elects the teaching staff and controls the finances of the institution. The first chairman of the "curatorium" was Prof. M. Lazarus, who held that office for twenty-three years, until his removal to Meran. The present chairman is Dr. S. Neumann, who also was a member of the first "curatorium." The faculty at first included David Cassel, Abraham Geiger, I. Lewy, and H. Steinthal; it has since included P. F. Frankl, S. Maybaum, M. Schreiner, E. Baneth, and I. Elbogen. Any one attending, or having attended, a German university and able to pass a simple examination may be admitted as a regular student. The teachers admit special students at their discretion. During the first twenty-five years of the seminary's existence 168 applicants were granted admission as regular students and 140 as special students. Of the former, 55 were born within the German empire, 1 in the grand duchy of Luxemburg, 68 in Austria-Hungary, 27 in Russia, 3 in Rumania, 2 in England, 1 in Sweden, and 3 in America. 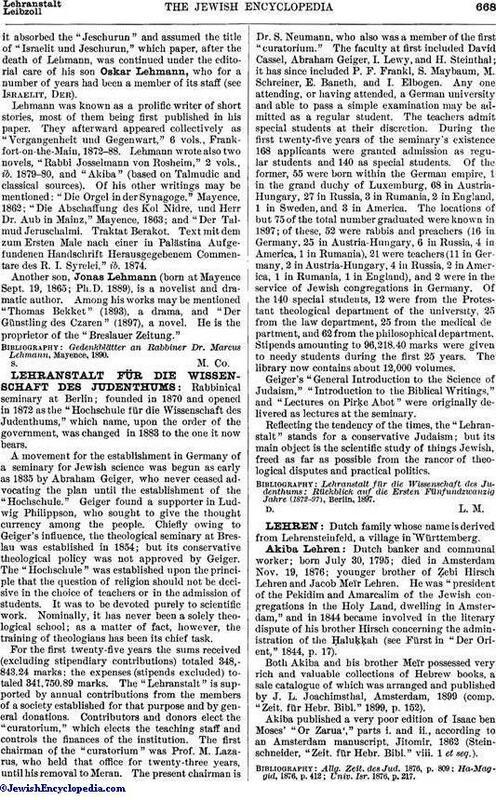 The locations of but 75 of the total number graduated were known in 1897; of these, 52 were rabbis and preachers (16 in Germany, 25 in Austria-Hungary, 6 in Russia, 4 in America, 1 in Rumania), 21 were teachers (11 in Germany, 2 in Austria-Hungary, 4 in Russia, 2 in America, 1 in Rumania, 1 in England), and 2 were in the service of Jewish congregations in Germany. Of the 140 special students, 12 were from the Protestant theological department of the university, 25 from the law department, 25 from the medical de partment, and 62 from the philosophical department. Stipends amounting to 96,218.40 marks were given to needy students during the first 25 years. The library now contains about 12,000 volumes. Geiger's "General Introduction to the Science of Judaism," "Introduction to the Biblical Writings," and "Lectures on Pirḳe Abot" were originally delivered as lectures at the seminary. Reflecting the tendency of the times, the "Lehranstalt" stands for a conservative Judaism; but its main object is the scientific study of things Jewish, freed as far as possible from the rancor of theological disputes and practical politics. Lehranstalt für die Wissenschaft des Judenthums: Rückblick auf die Ersten Fünfundzwanzig Jahre (1872-97), Berlin, 1897.